I don't like drywall. I like plaster. I don't like composite mouldings. I like hardwood. I don't even like prefab mouldings. I like to cut my own. So why would I like something as new-fangled and artificial as engineered flooring? Actually, I don't. Even though I went through bloody hell to lay those herringbone floors in the living room, solid hardwood is still my first choice. But there were reasons why engineered flooring was the better option for the second floor in my house. One is that I didn't want to add an extra 1.25" to the height of the top stair. That's what would have been required if I'd gone with 3/4" hardwood. I can't count the number of times I've tripped because of uneven stair heights, on one occasion fracturing a shoulder. Also, an engineered floor has a finish at least twice as hard as that of any job-site applied finish. With two big dogs tearing up my hardwood floors downstairs that's not a small selling point for me. However, there's a big "but" with this stuff which I'll get into later. Just to be clear, engineered flooring is in a different class from laminate a/k/a Pergo™ flooring. It's got a facing of real hardwood over a plywood backing. You can even sand them, although the best grades have 30 year warranties. Here's a pretty good engineered flooring FAQ so I won't go into the details, except that I chose Mannington's Ashville Saddle Oak Plank -- the same stuff I used in my office and guest room. Before some wag says, "Hey, the original floors look great! Just refinish them! ", I did! Five years ago. These yellow pine floors are a PITA. Despite three coats of oil poly, they're delaminating. This is probably due to years of some PO using liquid wax on the raw wood which only melted further into the floor with the heat of sanding. I've got so many splinter scars in my feet they look like they belong to a junkie. 'nuff said. Let's move on to the HowTo. Preparation is critical to laying an engineered floor. The first step is to tighten up the existing floor to eliminate squeaks. I did this by driving 1-5/8" deck screws into each floor board at every intersecting joist. Five pounds of 'em in the bedroom and hallway. I used a nail finder to locate the joists and penciled a guide line down the floor. 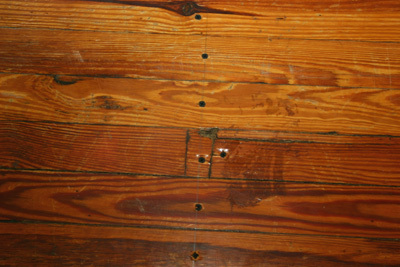 Next, use a six-foot level or a very straight board to look for high spots in the existing floor. Any bump 1/4" higher than the surrounding floor over six feet should be sanded down. Fortunately, I only had one of them. A belt sander made quick work of it. Now you've got to deal with the low spots, with the same dimensional restrictions. The solution in this case is floor leveler, a vinyl-fortified cement mix. I used Armstrong S-194. Sand the area with 60 grit to remove the old finish, mix up the leveler and trowel it on. Use a screed board to level it with the adjoining floor. This stuff dries very quickly (12-20 minutes) so mix small batches. It also sticks to anything, including expensive lavatory faucets. Ask me how I know. Then vacuum the floor thoroughly, fixing any protruding screw heads. Depending on how you will lay the floor, you're almost there. You have three installation options with engineered flooring: floating, glue-down or staple down. I'd never have a floating floor in my house so we'll skip that one. I did a glue-down in my office. While the results were good and in some respects superior to staple-down, it was one of the most miserable, messy jobs I've ever tackled. I wouldn't recommend it. Staple-down is the way to go. But you'll need a compressor and a stapler capable of driving heavy 1-3/8" staples, like the Spotnails WS4840. They're expensive but don't even think about buying one new. You can find them on eBay for around $40. They're almost useless for anything but laying flooring so a lot of them wind up there after their owners' flooring jobs are completed. Using a hammer stapler, lay down either rosin paper or builders felt. I prefer 15 pound builders felt because it has a slight cushion to it. You can also use 30 pound felt, or two layers of 15, for additional cushion. The first course is the most important. If it's cockeyed, your floor will be a mess. The instructions that come with the flooring will explain the details and caveats. All I can add to them, besides the warning to read those instructions carefully, is to watch the depth of your staples. My manual said to set the compressor to 80psi. Because I had a hundred-foot hose on the compressor, I needed 90psi to get the staples to seat properly. This is important because of the tight tolerances in the flooring tongues. If the staples are too high you'll see little lumps in the face of the finished floor, which will become abrasion points later. Too low and they'll split the tongue. I got this much done in five hours. Keep the floors clean!. Sawdust on these prefinished floors makes them as slippery as ice. I agree with you sentiment about the hardwood floors. We just built a new home and ended up using engineered flooring because everyone told us that we needed to use it over radiant heat. I'm not convinced...and if...big if...I ever build another new home I'll just go for it with solid wood. Having said that our brazilian cherry engineered floor is actually holding up pretty well. Best of luck witht he project. We have lived in our new home for 7 months. It has mannington engineered hickory wood flooring throughout the main level - over 1500 square feet. We are completely disatisfied with its ability to be a reasonable flooring option. The top wood veneer surface has no water resistance at all. If our children spill water and we don't catch it literally within an hour, the top venner cracks and ripples along the grain. Our previous home had 3/4 inch solid hardwood and we never ever had any problems like this. As well, the mannington flooring is no where near as durable to scratches and dents. It is beyond me to believe that these floors are considered to be reasonable for any family. We are currently waiting for our builder and flooring installer to look at the floors and determine whether this is a warranty issue with mannington - perhaps it was a poor batch as Mannington I understand is considered to be one of the better engineered flooring companies. Either way, we've come to the realization that the entire floor will probably need to be replaced - the veneer is too thin to resand and I'm not sure whether that would even help as I suspect we would continue to have durability issues. To consider replacing our floors after only 7 months is a crime. We will probably replace with 3/4 inch solid hardwood. It's now one year later and Mannington has advised us it is due to face-checking caused by environmental (humidity) swings within the home. The finish has tiny hairline cracks which allow moisture to penetrate, which is why we've had such poor water durability with these floors. As a result, they say it's not their problem. The fact is, this problem only appears on the flooring that was manufactured in Sept '05, a full 14 months before our builder took delivery and installed the flooring. A small part of the floor from a date run of Sept '06 doesn't exhibit the same checking and cracks. 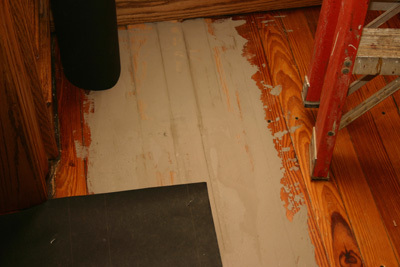 Our suspicion is the '05 flooring endured poor storage before we took delivery. If it was poor humidity in our home i would think all the flooring would have the problem. Has anyone experienced this before? We are completely frustrated with mannington. Again, given the choice, it would be solid hardwood next time for sure. I don't believe them. I purchased my Mannington flooring in the spring of 2006. Most of it has cracks in the finish which has caused increasing "crunchiness" under foot. Because I have musical instruments, I always keep the humidity reasonably constant in the house. I have a 5 gallon/day humidifier that runs during the heating season. This finish condition actually first showed itself under a plastic protective mat I have at my desk to prevent the chair from denting the floor. Only a few months after installing the floor I saw that the finish was getting damaged, possibly by humidity trapped under the mat. In any event, a company which brags about a 15-year guarantee shouldn't be selling a product with problems like this appearing so early in its life. I had to go with laminate because of a west facing window and lots of fading on the old carpet. Instead of dogs, I have a cat that now likes to run down the hall and slide into the glass door at the end. I keep looking for scratches, but nothing. However, the best result of putting down flooring is that my son's asthma problems went down 90%. Amazing. Love your site, keep up the good work (and the photos!). The biggest problem with engineered flooring isn't scratching. It's denting. The finish holds up well but the hardwood is a thin cosmetic layer over plywood, and plywood is soft wood. Can you show some pictures of the engineered flooring? Believe me, these shots won't be seen on the manufacturer's product web site. Every time I see another piece of my five year-old floor shredded and looking shabby, I get angry at the false claims of engineered flooring. I put together this "Cheat Sheet" to help homeowners in New York with a starting point and some very basic knowledge on what the options are. For many people, engineered wood represents a great compromise between durability and authenticity. In fact, after a couple of years with it I've come to the conclusion that engineered flooring is about the least durable flooring you can buy. The manufacturers claim that the finish on engineered flooring is much harder than the job-site applied finish (i.e. urethane) over a typical solid wood floor. That claim may be true but it's disingenuous as an overall durability claim. What they omit is that engineered flooring is a LOT more prone to dents and gouges than either a hardwood or laminate floor. A hard finish won't prevent that. One of the most popular Google search phrases sending people to this site is some variation of "dogs+engineered flooring". Metaphorically, that might as well be "oil+water". The two definitely do not mix. Neither do engineered floors and women's stiletto heels. While the top layer of an engineered floor may be real hardwood with a very wear-resistant finish, the plywood substrate beneath it is soft. That hardwood layer is simply too thin and flexible to resist denting by itself. 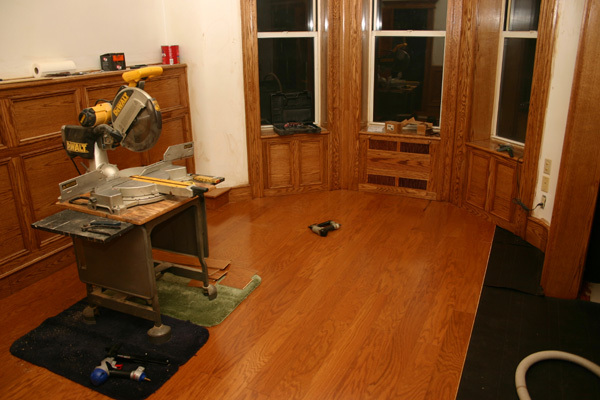 Worse, engineered floors can cost as much, or even more, than a solid hardwood floor. Online, I paid $5.50/sf for the Mannington stuff I used here. I could have bought solid, pre-finished oak t&g flooring for about the same price. In the end, the installation job would have been about the same as well. Instead of a pneumatic stapler I would have used a floor nailer. My advice to anyone considering engineered flooring is, "forget it". Or at least until they produce engineered floors with a carbon fiber or kevlar substrate. Unless you have no animals and you walk around in stocking feet, go with solid hardwood. We have an old home that needs new floors. In the 1980's addition, we put laminate down, figuring it would hold up to the dogs (each over 80 lbs), boys (3 sons, ages 14 to 4) and general debris. I also didn't feel too guilty for not using hardwood since it was a later year addition. The floors do hold up. The dogs take off running on it and there are no scratches. HOWEVER, I haven't found a way to clean it. There are streaks all over the floor, no matter what I do. I've heard that if I get down on my hands and knees and use a cloth and rub hard and only in one direction, there will be no streaks. With three boys, 2 dogs, 2 jobs and an old home to restore you KNOW we have time for that. It's really frustrating. As for engineered floors, we considered putting them in the entry way and connecting dining room, since they are supposedly more durable. I'm very glad that I found your website. So, what IS durable with large dogs? Would factory finish hardwood floors hold up to the claws of animals as they decide to take off after the cat? (I forgot about her) Or, will I get claw marks either way and just need to choose between a scratched up hard wood floor and a scratched up engineered floor? As far as I'm concerned, until I find a practical cleaning method, laminate floors just aren't an option. Besides the guilt (putting laminate in a new home feels okay, an old home with 100 year old 10inch wood trim? ), I just can't deal with the streaky mess. I can't offer any cleaning solutions for laminate floors but have you tried white vinegar and water? Streaking is usually caused by the cleaner left on the floor. Water evaporates without leaving any residue except for spotting, which the white vinegar takes care of. 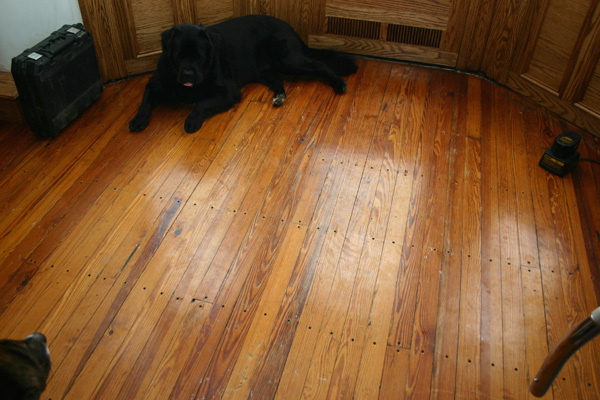 I don't think there's a wood floor made that will stand up to large, energetic dogs but there are degrees of damage. My hardwood floor on the first floor had held up a LOT better than the engineered floors but it's got scrapes and claw abrasions too... fortunately not down to the wood yet. I think probably the best solution is a solid hardwood floor with 4 or 5 coats of a job site-applied oil-modified urethane and NO STAIN. Not staining the floors means you can do periodic rescreenings followed by another coat or two of urethane. Acid-cure and moisture-cure urethanes are tougher than oil but I *think* they need to be completely removed before refinishing. You will also find varying opinions on whether engineered floors are viable for kitchens or under washer/dryer machines. I'd lean toward keeping engineered wood out of a kitchen altogether but with the new trend of opening one's kitchen onto the den or living room, many people want that all-one-floor look and don't want to break it up with tile. Unless those yoga students are working out in high heels, you probably wouldn't see much damage to their engineered floor. Since engineered floors are a relatively new product I'm curious why you found yourself needing to sand one so early in its lifetime. 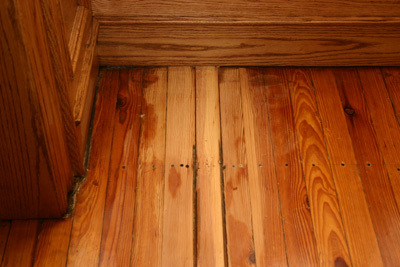 A solid hardwood floor can easily go 30+ years between sandings. When I researched this before purchase, Mannington was one of the top-rated engineered flooring products for durability. You're going to need a flooring contractor. The 3-1/2" flooring is probably your best bet. While the the difference in width will be noticeable if you look for it, I suspect it won't be visible to most people. However, the issue there is that the installer will have to remove an entire course of flooring, wall to wall, and install new flooring all the way to the parallel wall. My engineered flooring probably has another two years on it before the dogs rip through to the plywood base. When that happens, I'm laying a new SOLID hardwood floor on top of it. No more engineered flooring for me. I am installing a 3/8"
I replaced the carpeting in one of my bedrooms with an engineered wood floor. The contractor installed it as a floating floor over insulated padding and finished his work on New Year's Eve. What has become apparent is that the contractor failed to clean the sawdust on the subfloor and now it's seeping out from between the floorboards, making it difficult to breathe in that room. It's very bad; the plumber was here for another problem, and he affirmed that I'm not being ultrasensitive. I already vacuumed the entire room from top to bottom (while wearing a dustmask), and I cleaned the entire floor using the manufacturer's suggested products. Yesterday I had to break down and buy an air purifier; it's been on for over 24 hours, but it isn't helping much, at least not yet. The only thing that's helping somewhat is that I have been keeping the window open with the door shut. I can't begin putting things back inside the room until the dust dissipates and I can breathe without wearing a mask. Tonight I need to close the window, as they are predicting about 10 inches of snow and a possible blizzard. Without the window open, I may not be able to sleep in my apartment. What do you recommend that I do in order to get rid of the sawdust and the heaviness in the air? Is there something I can spray into the air or some machine that can help dispel the dust? How long will it take for me to be able to use my room again? Should I get some device to monitor the parts per million of pollutants in the air before I go into the room without a mask? And if so, what do I need to look for? Incidentally, my contractor had to go into the hospital--for a breathing problem. Engineered wood is produced with three to five layers of hardwood. Each layer is stacked in a cross-grain configuration and bonded together under heat and pressure. Engineered wood floors are a cost-effective way to attain the beauty of wood floors. They’re also quick to install. The final work isn't done on site, so you avoid any smell of finish and dust from sanding. All that may be true but "ease of installation" in an engineeed wood floor is a high price to pay for a floor which is vastly inferior to, and has a much shorter lifespan than, a solid lumber floor. Furthermore, engineered flooring isn't even all that economical. I paid $5 sq/ft for my Mannington engineered red oak floor, which I installed myself. I can get 3/4" solid Select red oak for as low as $2.50 sq/ft (unfinished) and $4 sq/ft (prefinished). The equalizer is the difference in installation cost, which is negiigible after all costs are included. Six years later, the Mannington floor I installed on my second floor is practically ready for the dumpster, and it's not even a high-traffic part of the house. It's covered in gouges and scratches from dog claws -- many of them down to the plywood layer, dents from dropped objects, scuffs from heels and there's even a weird rough/discolored area under the plastic floor mat I use to "protect" the engineered floor from my office chair. There was evidently some chemical interaction between the finish and that mat. At the time I installed that floor, Mannington was one of the highest-rated manufacturers of engineered flooring too. I'd hate to see what a box store brand would look like now. The engineering floor I installed here is without a doubt the worst construction decision I made in the renovation of this house. It even pales beside the pink Jacuzzi I accidentally ordered. I'm planning on writing a scatching article about engineered flooring here soon. Mannington, watch out. (I usually delete and report obvious link spam posts like yours to Mollom but I had to vent).